When Thomas was here on leave he had Kassie and I lifting weights in the gym. We were just going for 30ish minutes of cardio and the 15 minute ab class. I thought we were special because we went to the gym. Then Thomo came and made me lift. And now I’m obsessed. It was easy having him here telling me what to do and how many. I need structure and a schedule (shocking right?) and him being my guide was perfect. Then he was leaving. 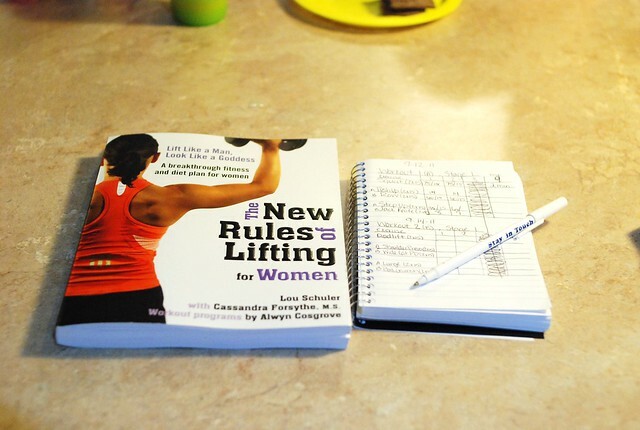 I ordered The New Rules of Lifting for Women from Amazon. It’s a great book. All about why women don’t need to be afraid of weights and how the body works with lifting/cardio. Tons of great info. There is also a whole nutrition section that is all about NOT starving yourself. My kind of diet! It comes with recipes but isn’t a full on meal plan. More of a guide. The workout section is broken into 7 stages with the 1st stage being the longest. Stage 1 has no cardio in the workouts but you can do some on your off days…not that you wont be grunty and sweaty already though. Stage 2 brings in interval training. Another thing the book likes. No long runs. So, now that I’ve finished stage 1 I’m going to post my stats. Remember, Workout 1 was 2 sets of 15, and the last was 3 sets of 8. Step Ups on 5 risers: Start – 10lb, End – 20lb, Final – 30 at 10lb each leg. Looking at that feels good. Some of them (step ups and lunges) I’m sure I could have used a heavier weight toward the end but I hate them and didn’t want to. The push ups AMAZED me! During the 2 sets of 15 I was lucky to get my 15 out. Sometimes I only did 14 and once only 13. Now I can do 24 all at once on the bench. Dude! The pull down was exciting too. When we started the 60lb wasn’t TOO terrible but today it was like nothing. Love it! I do feel stonger since starting this. I took before and after Stage 1 measurements. Everything is about the same except chest is up an inch and waist is down .25in. Good for me! Now the fun part is I’ve gained weight. Doesn’t sound fun and at first I flipped out a bit. From 158 to around 161-163…I wanted to cry until I realized my measurements are the same…which means I’m solid lol! Yay muscles!